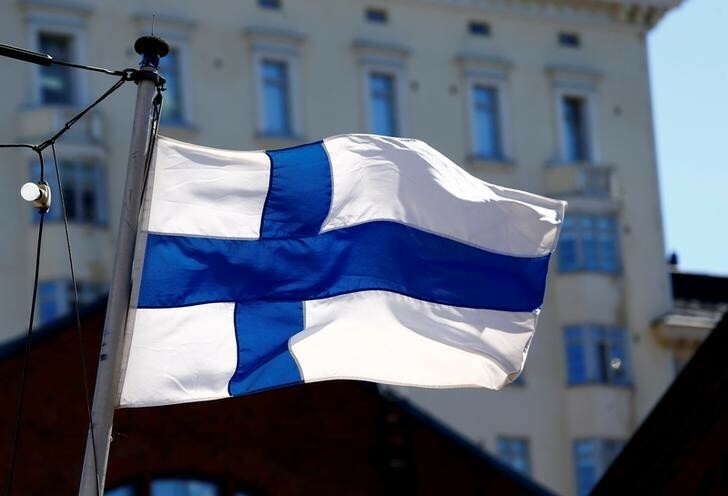 Finland is the happiest country in the world closely followed by Norway, Denmark and the Netherlands. But some of the world’s richest nations, including the US and Japan, are found much further down the list. The disparity between wealth and happiness has caused policymakers to broaden their scope and look for other indicators to assess the health of nations, rather than just measuring economic success through GDP. But happiness – or well-being – is subjective and notoriously difficult to quantify. This report is based on international surveys in which thousands of respondents were asked to imagine a ladder with steps numbered 0 to 10 and say where they felt they stood. And it cites six significant factors which contribute to happiness; GDP per capita, social support, life expectancy, freedom to make life choices, generosity and corruption levels. Although the US ranks highly for per capita income, it is only ranked 18th out of 156 countries, substantially below most comparably wealthy nations. Wealth doesn't always equate to happiness. That is because it performs poorly on social measures: life expectancy has declined, inequality has grown and confidence in the government has fallen. The renowned economist Jeffrey Sachs, who was one of the report’s editors, said the fact that the US was still falling down the rankings was very worrying and revealed deep stress amongst its citizens. Sachs highlights three interrelated diseases that need to be tackled; obesity, substance abuse (especially the opioid crisis) and depression. 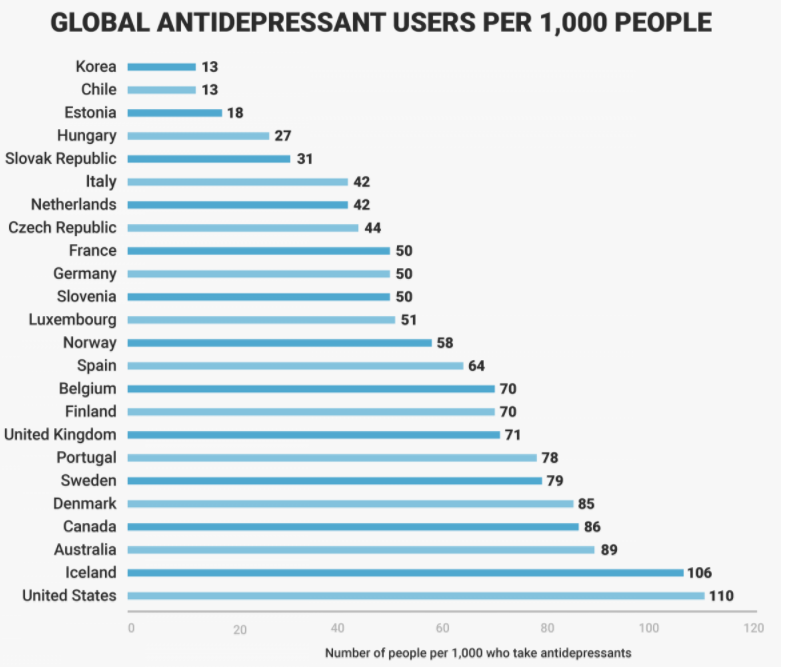 The US has one of the highest rates of obesity and the highest rate of antidepressant use in the world. And the plight of the US stands as a pertinent example of why economists are increasingly concerned with measuring happiness rather than wealth. The report also tried to assess how migration affects happiness, and surveyed the happiness levels of immigrants in each country for the first time. It found that the happiness of a country’s immigrants is almost identical to that of the wider population, and the people adjust to the average happiness level of the country they move to. 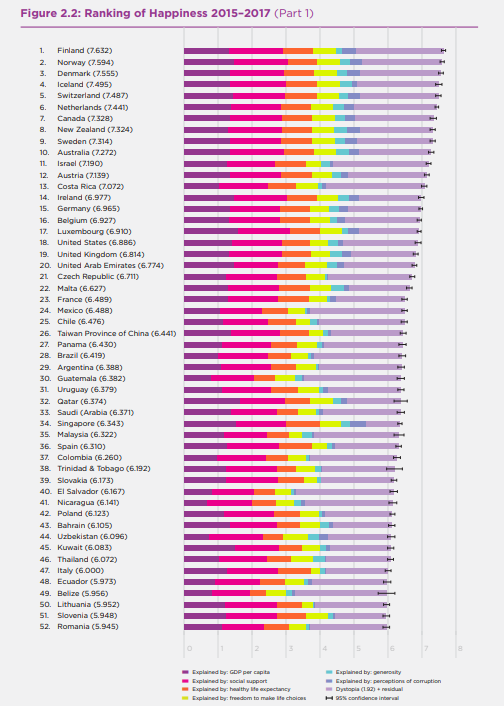 This suggests that happiness is less about cultural norms and attitudes, and heavily influenced instead by surroundings and the quality of life that a country can offer. A person who moves to a country higher up the happiness list, for example, is likely to become happier, while a person who moves to a country lower down the list will also feel unhappier. And Finland not only has the happiest people, but also the happiest immigrants.